"..a cavalier disregard for the local residents and makes a mockery of the consultation process." On last Thursday 17th March the Wandsworth Council Planning Committee approved the planning application for the redevelopment of the Tileman House site on the Upper Richmond Road. The Putney Society has consistently opposed the form of this approved development primarily on grounds of height and encroachment on the Upper Richmond Road footway and upon neighbours. The Society has consistently supported the need to redevelop tired sites in Putney but on a scale of height and mass consistent with the character of our local neighbourhood. To this end the Society members engaged fully in the earlier Council consultation exercises to develop the local development planning policies. Whilst the residents consider many of these policies to have been pre-ordained, unchanged and in a number of respects unsatisfactory, they still represent a set of rules. The Tileman House site has had a long history of planning applications being made. One of the more recent was refused and an appeal was turned down by the Planning Inspector who commented that the building “would have an extremely dominant relationship with the street scene” and was “an oppressive and highly discordant element in the street scene”. The building that WBC have approved is now reduced in height but in most other respects, except for minor detailing, is identical to the refused application including the proximity of the floor plate to the pavement. The proposal breaks many of the Council’s planning policies (Development Management Policies Document sections DMS1, 2 and 4). The planning application consultation for this site received 138 objections, a 122 signature petition for rejection and 1 letter of support. Misleadingly the lead figure for objection letters was quoted as 42, being the objections to this application in an earlier form. The planning case officer recommended that the application should be approved. It appears that many points of objection were casually dismissed in this recommendation including those of Justine Greening MP and Cllr Torrington’s concerns about transport capacity availability. 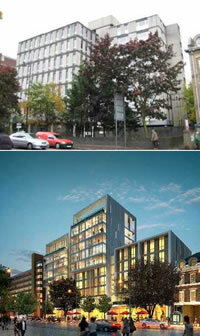 The discussion at the Planning Application Committee meeting on the 17th March also raised a series of concerns. The planning officer presenting this case, of such importance to Putney, did not know the answer to many of the questions posed and in some cases gave incorrect answers (e.g height given in the SSAD policy for this site and whether the building line was being retained). The majority Members of the Committee did not question the important and highly relevant issues raised by Councillor Morritt on behalf of local residents at the start of the meeting, giving the impression that the meeting was just a formality. Unfortunately the only Putney Member on the Committee free to speak was unable to be present on the evening. The Chair dismissed four years of discussion of the “canyon like effect” in Council planning documentation and the Inspectors report and indicated that he did not think it pertinent any longer. The Chair referred to the precedent of 113 Upper Richmond Road having 11 storeys approved when Council officers have always stated that under new policies precedent was not relevant. Overall, a poorly produced and presented case report ignored many of the policies recently developed by the Council themselves. The net result demonstrates a cavalier disregard for the local residents and makes a mockery of the consultation process. It should be noted for the record that this is being done “To” our Putney not “For” Putney. What worth the words of Cllr Edward Lister, Leader of the Council, uttered at the local hustings in 2010, that new buildings on the Upper Richmond Road would be “similar in height” to existing buildings?